The Sombrero Galaxy or M-104 is located about 28 million light years away in the constellation of Virgo. In this Hubble Space Telescope, 6 photo mosaic, we view this spiral galaxy edge-on (actually a very shallow 6 degrees north of its equatorial plane). Because of this positioning, astronomers can glean quite a bit of detail as to the thickness, density and composition of the massive ring of gas and dust or “dark stratum” as William Herschel noted, that surrounds the galactic plane. The massive central bulge is the other easily noticeable feature that helped to deliver the nickname, Sombrero Galaxy. Also surrounding the galaxy (above and below the galactic plane) is an extremely vast system of globular clusters that number around 2000. That’s roughly 10 times more globular clusters than our Milky Way galaxy. They are similar however, in the fact that they are an estimated 10-13 billion years old and are some of the oldest features in the galaxy. Also housed in the galaxy is, at its center a Super-massive Black Hole with a mass of a monstrous one billon Suns. A little known fact here is that Charles Messier only catalogued 103 objects in his collection of non-comets though the current catalogue runs through 109. Well, in 1921 Nicholas Camille Flammarion, a French astronomer and a colleague to Charles Messier found a short list of 6 objects that messier had been observing but had not yet added into his catalogue. One of those objects was a hand written note about the galaxy but it took time to find that out. After much research it was determined that the object described in the notes concurred with the object associated with NGC 4594 in the New General Catalogue (an updated and modern list of John Frederick William Herschel’s Catalogue of Nebulae and Clusters of Stars). It was then they were added into the Messier Catalogue with the other 5 objects as M104 through M-109. – He also has a writing called “End of The World”….look it up sometime. 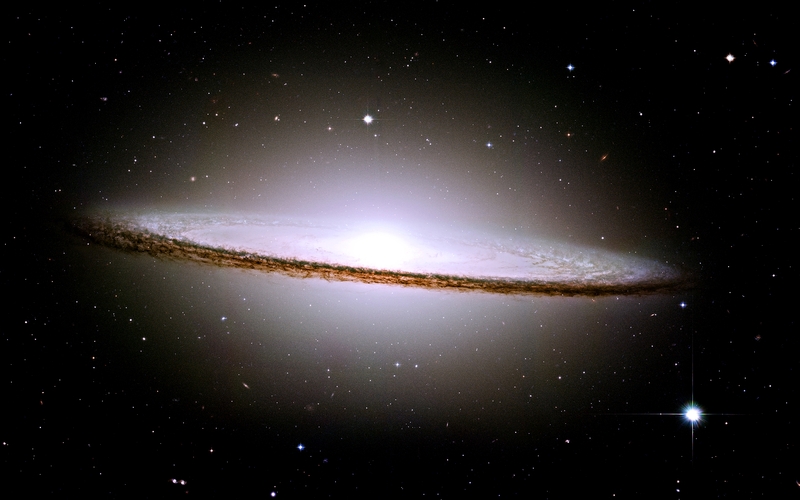 Name: Messier 104, M104, NGC 4594 or the Sombrero Galaxy and sometimes called Dark Saturn. What is it? : Spiral galaxy viewed edge on. How far away is it? : 28 million light years or 9 megaparsecs distant. How big is it? : This image is roughly 10 arcminutes (82,000 light years or 25,000 parsecs) wide so the galaxy itself is around 50,000 light years across or about 8×4 arcminutes. Apparent magnitude? 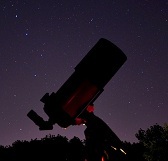 : Around 9 or +9 so although it’s too dim to view naked eye, it’s attainable in small to medium telescopes. Discovery: May 11, 1781 by French astronomer, Pierre Mechain. Where is it? (General): Constellation Virgo. Where is it? (RA/Dec J2000): R.A. 12h 39m 59s.43 / Dec. -11° 37′ 23″. Image | This entry was posted in Astronomy (Learning), Astrophotography (DSOs), Galaxies, Images and tagged DanSpace77, ESA, Galaxy, Hubble, M-104, M104, NASA, NGC 4594, Sombrero Galaxy, Space, Telescope. Bookmark the permalink.